10-12 vikur pöntunartími ef ekki á lager. Rafsegulmengun = sjónvarp mG 4 , örbylgjuofn mG 200, ísskápur 6.5mG, þurrkari 27,9mG. Einfalt að setja upp (30mín) og stinga svo í venjulega rafmagnsinnstungu. Eyðir eins og hárþurrka eða ristavél. What is far infrared heater technology? Infrared heater technology is completely healthy and safe for all living things. The benefits of far infrared to us. One of Far-Infrared light's characteristics is the ability to easily penetrate human tissue. When this happens, it creates a natural resonance, which has many beneficial properties. The Far-Infrared heat (Far-infrared light waves) penetrates your skin, giving you that wonderful natural warmth. Far-infrared heating is used in hospitals to warm newborn infants. Whereas conventional saunas transfer heat by circulating hot air, thereby warming your body from your head down, the far infrared heat rays warm your body directly. This allows an in-depth heat in a more pleasant temperature of 110- 138°F (43 - 60°C ) , thus providing more health benefits and a highly enjoyable and comfortable environment. Sólarljósið er breiður skali af tíðni ljósgeisla, þar á meðal eru infrarauðir geislar. Sýnilegir ljósgeislar eru fyrir miðju í þeim skala. Á hærri tíðni breytast sýnilega ljósið í útfjólubláa geisla sem geta valdið sólbruna. Á lægri tíðni breytist sýnilega ljósið hinsvegar í milda Infrarauða geisla. Það eru infrarauðu geislarnir sem gera það að verkum að sólin hitar okkur upp, jafn vel þó að það sé kaldur vetrardagur. Infrarauðir geislar eru á skalanum 0,76 til 1000 ..
Infrarauður ljósgeisli = Djúp hitun. Infrarauðir ljósgeislar fara inn í líkama okkar um 4.5 cm sem örva þannig innstu vefi og líffæri , sem gerir það að verkum að einstaklingurinn svitnar meira og djúp hreinsun verður og óhreinindi sem erfitt hefur verið að losna við flæða út í gegn um húðina í miklu meira mæli en í öðrum sauna meðferðum. 20 mín að setja saman og setja í samband. Losar þig við eiturefni úr líkamanum. Hjálpar við fitulosun ásamt minnkun á cellulite. Getur sett hvar sem er í íbúðinni. Auðvelt að taka niður og flytja með ef flutt er búferlum. Hér fyrir neðan getur þú lesið hvað infrarauð sauna er og hverskonar hita er verið að tala um, það er farið að nota infrarauða sauna víðsvegar í heilsugeiranum vegna allra góðu kostana sem hún hefur. Infrared light is part of the Sun's invisible spectrum of light that has the ability to penetrate the human tissue. Infrared heater technology uses these Far infrared light characteristics to heat the body directly rather than just the air. The experience of a far infrared sauna is similar to sunbathing, which gives you the radiant heat that is all your own. The Far infrared heat penetrates your skin, giving you that wonderful natural warmth. Unlike sunbathing, Infrared heater technology is completely healthy and safe. You can relax in a far infrared sauna it will never cause your skin to burn. 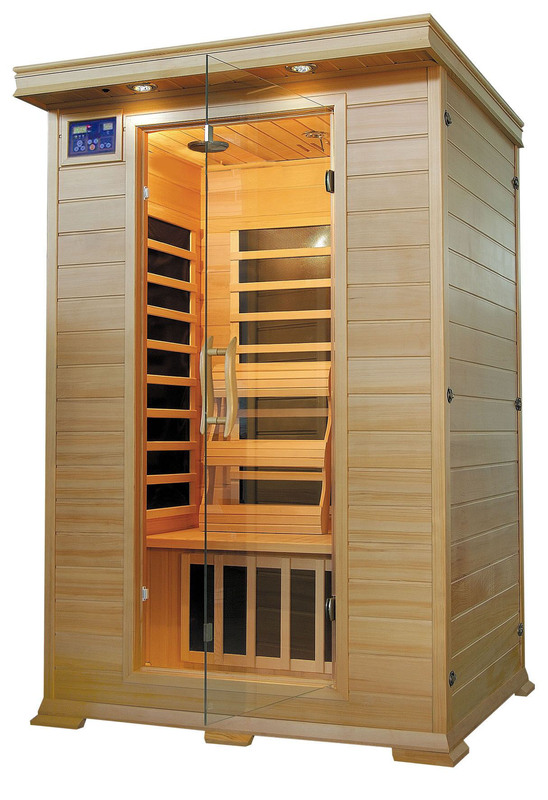 Why is a Far Infrared Sauna Better than a Hot Rock Steam Sauna? Far infrared saunas increase the body's core temperature. This helps the body rid itself of harmful toxins through a deeper sweat. Conventional hot rock/steam heater saunas heat the air with steam, which can often be unbearably hot and you will only sweat on the surface. Steam also makes the air difficult to breath. 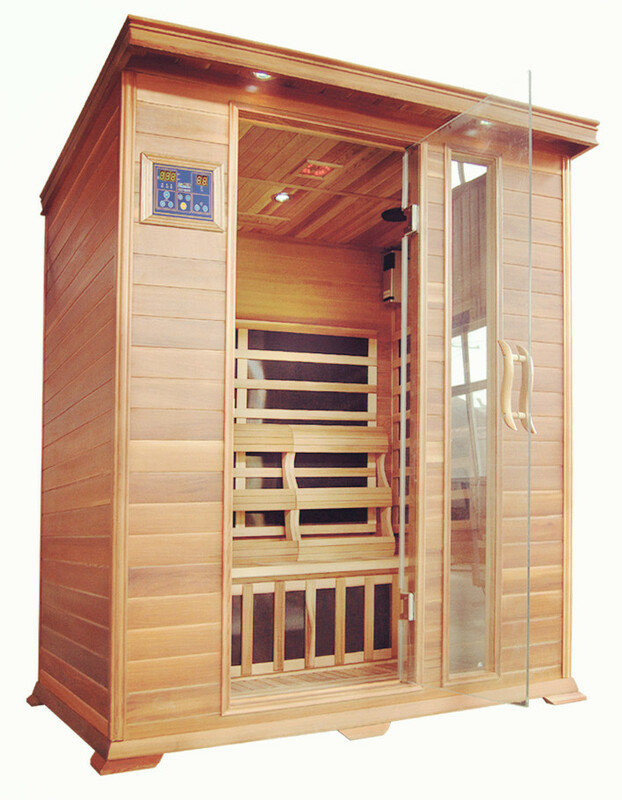 A far infrared sauna uses dry far infrared heat that is well ventilated and extremely comfortable and relaxing. Our infrared sauna costs less to operate because it uses very little energy - about the same amount used by a hair dryer or toaster oven. And it takes only 5 to 10 minutes to preheat, not the 30 to 60 minutes required by traditional saunas. 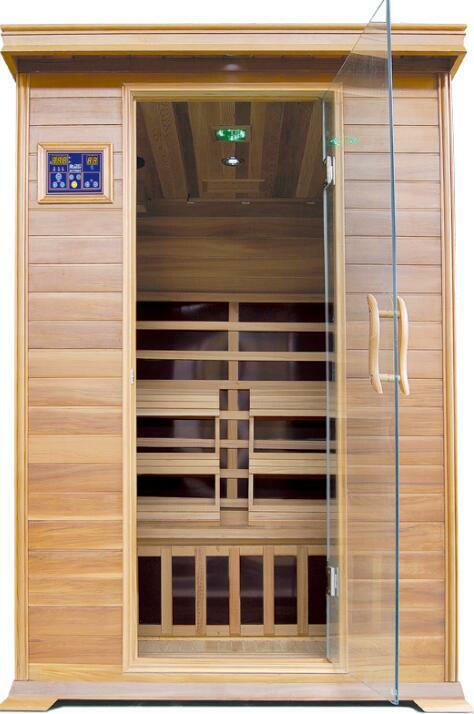 Our infrared saunas operate at safer, more comfortable temperatures than other saunas, only 41 - 57°C. Its radiant heat reaches deep, to be absorbed by your body as much as 1.5 inches below the skin, while producing 2 to 3 times more sweat than other saunas. Traditional saunas rely on a stove to heat the air to as hot as 95 °C. The energy they require can as much as double your electricity bill. And to be effective, this superheated air must remain tightly enclosed, resulting in a stifling, suffocating environment. By contrast, Our infrared saunas allow fresh air to circulate for ventilation and maximum comfort. As you relax in the gentle heat of the infrared sauna, your body is actually hard at work, producing sweat, pumping blood - and burning calories. in a single sauna session you may burn as many calories as you would rowing or jogging for 30 minutes. So you lose weight - not just water. "Many of us who run do so to place a demand on our cardiovascular systems, not to build big leg muscles. Regular use of a sauna may impart similar stress on the cardiovascular system. and its regular use may be as effective as a means of cardiovascular conditioning and burning of calories as regular exercise.... A moderately conditioned person can easily sweat off 500 gms. in sauna, consuming nearly 300 calories." The deep heat of your infrared sauna helps peripheral blood vessels dilate, bringing relief and healing to muscle and soft tissue injuries. Increased blood circulation carries off metabolic waste products and delivers oxygen-rich blood to oxygen-depleted muscle, so they recover faster. Muscles relax most readily when tissues are warm, for greater flexibility and range of motion. In Europe, radiant heat therapy is widely used to treat patients suffering from many forms of arthritis. In addition, it has been proved effective in the treatment of sprains, neuralgia, bursitis, muscle spasms, joint stiffness and many other muscular-skeletal ailments. Much of the stiffness, aches and soreness that comes with aging is reduced or eliminated. Infrared saunas help clear ugly cellulite, the gel-like lumps of fat, water and debris trapped in pockets beneath the skin. European beauty specialists routinely incorporate daily saunas in programs to reduce cellulite. And because the radiant heat of the infrared sauna warms three times as deeply as conventional saunas, it is significantly more effective at reducing cellulite. The profuse sweating achieved after just a few minutes in the infrared sauna carries off deeply imbedded impurities and dead skin cells, leaving the skin glowing and immaculately clean, Increased circulation draws your skin's own natural nutrients to the surface. You'll see improved tone, elasticity, texture and fresh color. * Increased blood circulation has also been shown to relieve acne, eczema, psoriasis, burns, lesions and cuts. In addition, open wounds heal more quickly, reducing scarring. Sauna's deep heat raises your body temperature, inducing an artifical fever. As it works to combat the "fever," your body's immune system is strengthened. Combined with the elimination of toxins and wastes produced by the intense sweating, your overall health and resistance to disease is increased. Perhaps the most immediate relief your infrared sauna offers is simple relaxation, as it melts away the stresses and tensions of urban life. Just a few minutes in the gentle warmth of your infrared sauna gives you an overall massaging effect, soothing jangled nerves and knotted muscles. You'll feel rejuvenated and renewed, restored in both body and mind. What exactly is radiant heat? No need to worry-it has nothing to do with either ultraviolet radiation (which gives you a sunburn and damages your skin)or atomic radiation (the kind from a nuclear bomb). Radiant heat is simply a form of energy that heats objects directly through a process called conversion, without having to heat the air in between .Radiant heat is also called Infrared Energy. The infrared segment of the electromagnetic spectrum is divided into 3 segments by wavelength measured in microns or micrometers (a micreons = 1/1,000,000 of a meter); 0.076~1.5microns=near or close; 1.5~5.6middle or intermediate; 5.6~1,000=far or long wave infrared. 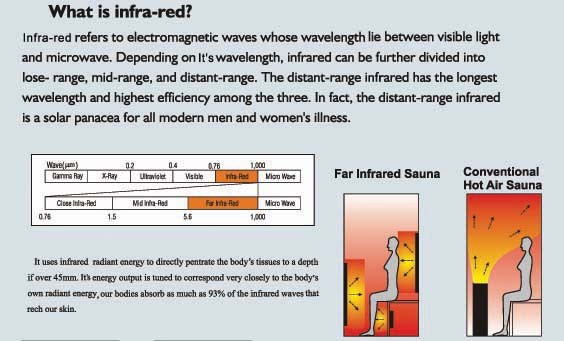 The infrared segment of the electromagnetic spectrum occurs just below or “infra” to red light as the next lowest energy band of light. This band of light is not visible to human eyes but can be seen by special cameras that translate infrared into colors into our eyes. We can, however, feel this type of light that we perceive as heat. Our sun produces most of its energy output in the infrared segment of the spectrum. Our atmosphere has a ”window” in it that allows IR rays in the 7-14micron range to safely reach the earth' surface. When warmed, the earth radiates infrared rays in the 7-14micron band with its peak output at 10microns. - Like exercise, taking a sauna speeds up your heart rate. The heat creates an increased need for oxygen, so you take deeper, fuller breaths. Increased oxygenation to your cells is among the important sauna benefits. - While using an infrared sauna, your organs, tricked into believing your body has a fever, respond by flushing out toxins, which are whisked away by the increased flow of both blood and sweat. - Infrared heat warms your body directly and creates a healthy purifying sweat at much lower temperatures than standard steam saunas. - Infrared saunas purge clogged pores of deeply imbedded impurities and dead skin cells. - Increased blood circulation that encourages a healthy flow of nutrients to your skin that helps relieve acne, eczema, psoriasis and burns. Encourage the healing of lesions and minor cuts. -A sauna benefits people with chronic heart failure. In a Japanese test, people who spent 15 minutes a day, 5 days a week for 2 seeks in a 60C sauna then 30 minutes on a bed wrapped in blankets had significantly fewer premature heartbeats and episodes of irregular heart rates compared with people who didn't take the saunas. The sauna people also had lower blood concentrations of two hormones linked to heart damage--a significant infrared sauna health benefit. The saunas used in this study were heated with infrared lamps and were cooler than traditional saunas. -Superior Detoxification: Removes Heavy Metals & Fat-stored Toxins. -Stimulates and improves the immune system. 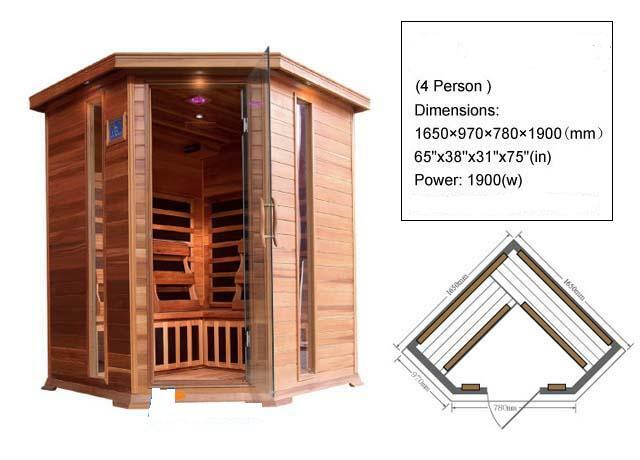 lower installed cost than traditional sauna, hot tub (spa), sweat lodge, or steam room. An infrared sauna can be installed in under an hour by any homeowner. No special tools, plumbing or electrical work are required. Infrared saunas consume far less energy than a conventional sauna, hot tub, or steam bath. A typical infrared sauna consumes about the same amount of power as a vacuum cleaner. Conventional saunas operate an extremely high temperatures which may be unsafe for the very young or elderly. Further, surfaces in a traditional sauna can reach temperatures that can cause burns. 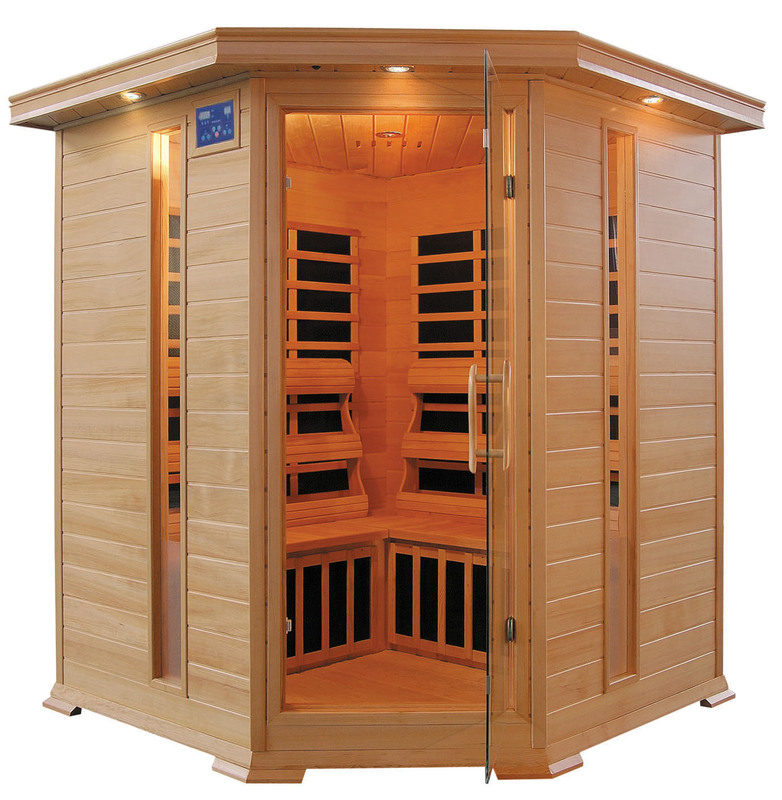 Infrared saunas achieve the same benefits at far lower operating temperatures. Due to the harsh operating conditions in a traditional sauna, a sound system to enjoy while your are relaxing in your sauna is out of the question. On the other hand, you can enjoy your favorite music in an infrared sauna. An infrared sauna can heat up to operating temperature in as little as 10 minutes, where as traditional saunas can often take more than an hour. This also helps save energy. A traditional 'wet sauna' typically involves very high humidity levels that create an ideal environment for the growth of mold and mildew. Infrared saunas are much cleaner. 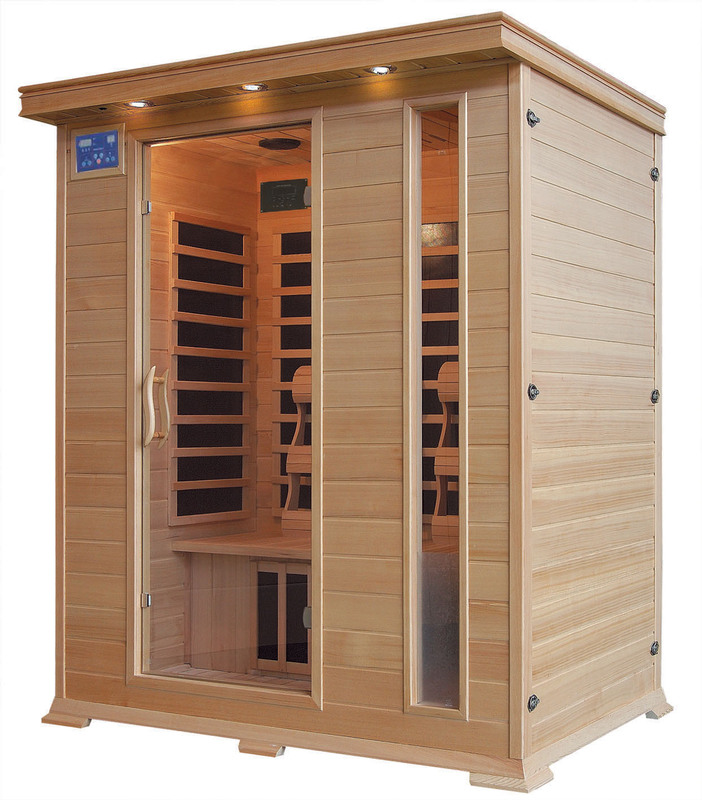 Infrared saunas are elegant and can be installed just about anywhere. If you ever move to a new home, simply pack up your infrared sauna and take it with you to your new location. Conventional saunas are usually a permanent installation. For some, but not all.